MUMBAI: A new study has allayed fears about the heightened risk of heart attacks due to regular use of a relatively new class of anti-diabetes drugs called gliptins. 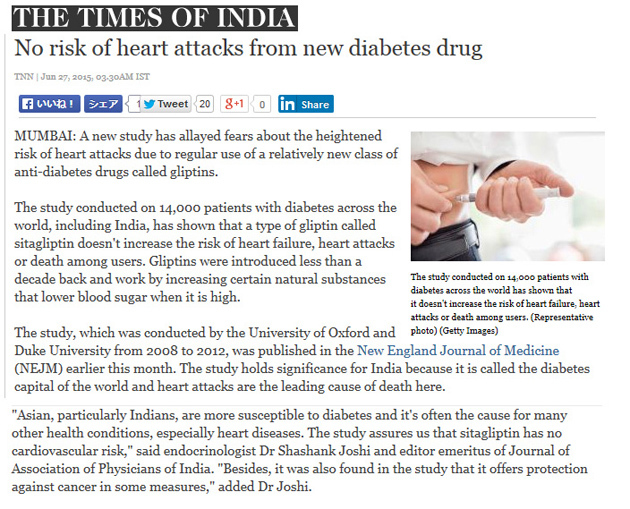 The study conducted on 14,000 patients with diabetes across the world, including India, has shown that a type of gliptin called sitagliptin doesn't increase the risk of heart failure, heart attacks or death among users. Gliptins were introduced less than a decade back and work by increasing certain natural substances that lower blood sugar when it is high. The study, which was conducted by the University of Oxford and Duke University from 2008 to 2012, was published in the New England Journal of Medicine (NEJM) earlier this month. The study holds significance for India because it is called the diabetes capital of the world and heart attacks are the leading cause of death here. "Asian, particularly Indians, are more susceptible to diabetes and it's often the cause for many other health conditions, especially heart diseases. The study assures us that sitagliptin has no cardiovascular risk," said endocrinologist Dr Shashank Joshi and editor emeritus of Journal of Association of Physicians of India. "Besides, it was also found in the study that it offers protection against cancer in some measures," added Dr Joshi.